Aluminium Roll Up Standee / Pull up Banner Stand are best solution for Advertising on exhibitions, trade shows, product launches, welcome signs and reception area signage for Promotion. We are offering our client an excellent quality range of Roll Up Standee. 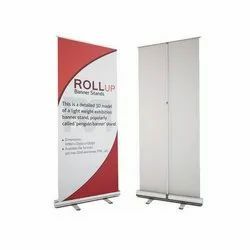 Our organization is ranked amongst the reputed names in the market for providing Roll Up Standee. Riding on vast volumes of expertise in this arena, we are occupied in offering Advertising Rollup Standee.